If you're the person who is called upon by friends and family for home repairs, you should consider starting a handyman business. This article will tell you step-by-step how to do it. Obtain a license - Depending on where you live, you may need a business license and a contractor license that identifies your qualifications. Call your city or town to apply for a business license. For your contractor's license, call the contracting licensing board in your state. You may have to qualify on specific repair areas, but it will be invaluable to gain the trust of your customers. Find out about the handyman laws in your state by browsing the state contractor website or visiting the library. Insurance - You will need to have insurance to protect your business against liability. The amount of insurance you require depends on the area where you live. Some contractor licensing boards require you obtain insurance on estimated annual income, other areas require you obtain both insurance and a bond. 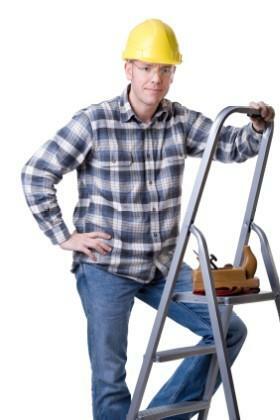 Insurance is gold in starting a handyman business. If you can't provide proof that you are insured, you may lose a job. Call your insurance broker for help on determining what sorts of insurance or bond you may need. Records and accounting - You can keep track of your income and expenses by utilizing a software program like Microsoft Excel. With this software program, you can make an effective spreadsheet that outlines each job, expenses, and income. If you're not a computer whiz, you can join DocStoc for free and download small business spreadsheets allowing you to track income and expenses. Most handy people are good at fixing most things around the house. Think about your skills to determine you strengths and weaknesses. Make a list of repairs you are most knowledgeable. You should also make a list of home repairs where your skills are average or you have little experience. This list can help you define what repairs you offer. For example, if you didn't know anything about large tree removal, you wouldn't want to offer this service. Be honest about what you can do if you want to succeed. Keep in mind that repairs you might not have experience with could be goal driven. Make it a business goal to learn new home repairs as your business grows. You will need a little more then word-of-mouth to succeed. Your advertising investment should focus on two areas in the beginning. To begin, place a business card size ad in your local paper. Each newspaper has a service area that offers many of these ads. Browse the ads and try to come up with ways to describe your business uniquely. You won't have much room in a business card ad, but often you can wow your customers with one-word phrases, like free estimates and licensed, bonded, and insured. Your second avenue of advertising is creating a business brochure. In your brochure, list all of your contact information including an email address. You can also include your liability insurance, bond and licensing numbers. This is impressive to clients and you'll get more jobs by answering their questions of whether you're licensed or insured in your brochure. Your brochure should be something that is simple yet lists the repairs you are qualified to perform. Along with the list of repairs, include a short bio on yourself. Tell your potential customers what community you live in, what areas you serve, what education or experience you have. For that special touch, list some personal items, interests, and hobbies. An example might be, Tom lives in the Cross Creek area, is married and has three children. Tom enjoys fishing, reading, and is a member of the Lion's Club. If you aren't good with word processing software, ask an a friend to help you create your brochure and find an affordable printer company for a professional look. To determine what you should charge, call other handyman businesses and ask what they are charging. If you call a handyman business that is thirty miles from where you live and work, chances are they will answer all of your business start-up questions. You might also start a network with others, gain some industry knowledge, and exchange ideas on home repairs. Once your handyman business is up and running, staying organized is essential for success. Plan your week and include time to work on your business income, expenses, and estimates you have given. Invest in a filing cabinet where you can stay organized. Keep track of jobs you lost and find out why. If it was a matter of price, adjust your prices. If it was a matter of education, get educated by attending some home repair courses at a community college. Keep advertising at the forefront of your business. When you can afford it, consider a radio ad spot, larger ads in the newspaper, and telephone book advertising. Starting a handyman business can be rewarding. It is a business where you can use your skills to earn an income. Remember to take the time to consider what type of handyman you would hire and why. Develop your business by defining yourself and your capabilities. Let your experience and commitment guide you to success.